We all have something that has been sitting in our desks for some time. We may have placed a sentimental value to them that is why we keep them but mostly we do store them because we no longer have use for these items. We know that they are worth a value and putting them to trash is such a waste, so instead of throwing them away, or just giving them to whoever needs them, you can also use old items to your and for others’ benefit. How? You can exchange items aka, barter. Of course we do have a bunch of clothes we no longer use. That can be because the kids have grown, or you have lost weight or you no longer prefer this kind of style or they are just put of fashion. Whatever it is you find boring in your closet might be bombastic for some, so you can pick from those clothes you no longer use and trade them for something you can wear today. Technology changes over time. Some people are gadget enthusiasts that tend to update their technology as often as necessary. But that is not the case for everyone. Some prefer pre-owned handsets as in the case of an Iphone. So when you feel like your gadget is already out of date (at least in your own time frame) someone out there might just be needing the one right at that moment. Go sign up in websites or post about this item and swap, swap, swap! This doesn’t just help you save money but introduces you to more people who can eventually refer you to others in exchange of not bartered service but of cash. Christmas. Yes. We are almost near Christmas season and this kind of exchange gets a boost during the moment! Do you have extra gift socks or decorations you no longer need and would want to trade with, say, cookie cutters or Christmas Tree decors? Go on, collect them and trade them! A lot of people nowadays prefer to save by re-using pre-loved items that are still pretty and sanitary. This could be really cool when you exchange with relatives or close friends or maybe trading with strangers can also add up to your already growing number of friends. When the children grow up, they end up in your display cabinet. Sad, right? Even if they give you some cute memories like how you brush Barbie’s hair or how you play soldier when the kids were little, there is nothing more cheerful than trading these stuff for things your children can find beneficial now. Trading toys with other toys (remember age appropriate?) Will give you more choices and can help you assist other people as well. By giving toys that other children need in exchange of stuff or toys that is more appropriate to your kids now, will save you money and space as well. 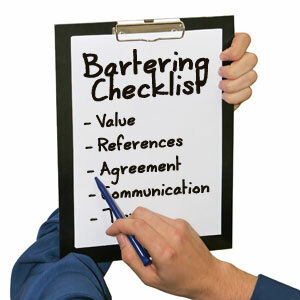 However, bartering is not limited to these items only since trading has now become really diverse. But one tip though, be sure that you are getting the value of what your good is worth.